Here's an idea of what advertising might look like if the wildly popular Mac centric blog, "I drank the kool-aid.com" (clutching my dixie cup of apple goodness) chose to take their message to the streets with off line creativity. 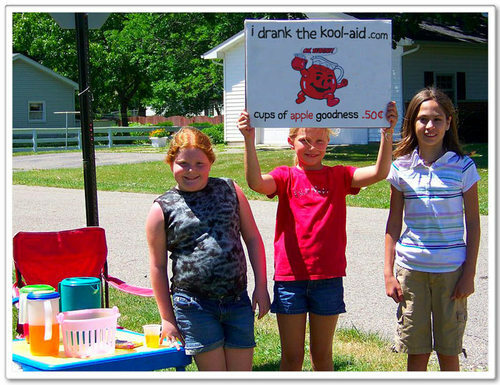 Several kool-aid stands could be set up in quiet American neighborhoods to sell apple juice and kool-aid with all supplies purchased by the blog, but earnings go to the grade school mini-marketers in exchange for their labor. Rather than battling for mind share inside the saturated online super highway, a grassroots marketing effort is put into effect adding up to a win-win scenario that may eventually have all of us drinking the kool-aid. What if? hopefully it will take root..
Well,as an offline way of marketing your site.It's good but it will just hold a specific place where you advertise your site.Online marketing is also a nice option to advertise around the world. The solution is having your website submitted to all the major search engines such as Google, Yahoo and MSN which combined send over 90% of all internet search engine traffic. For just $49.95 our search engine submission specialists will get your site listed on over 200 of the world’s leading search engines. We will submit your website instantly, so you will see the increase in visitors immediately.